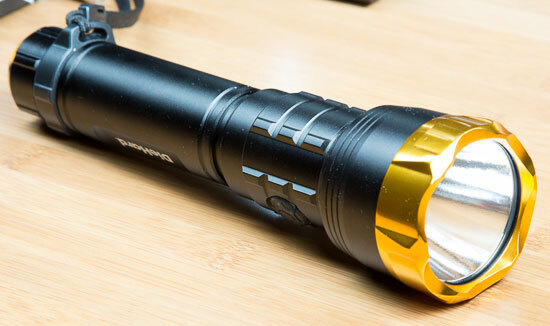 DieHard’s 6AA Extreme LED flashlight is incredibly bright, very solid-feeling, and has user-friendly controls. How bright? It lights up the room with 619 lumens on the high setting, 173 lumens at low. It’s kind of funny even calling 173 lumens low. My Fenix LD20 ($50 via Amazon) only outputs 180 lumens in its turbo mode. Lumens is a measurement of light output, and is often be used to compare flashlights to each other. If you’re not sure how bright 619 lumens is, it might help to instead compare flashlights in terms of throw distance. Just remember that throw distance is based on reflector and emitter design, as well as light output. According to DieHard, the flashlight’s beam can illuminate objects over 1000 feet away. The emitter and reflector designs give the flashlight a bullseye-type beam profile, with a very tight hot spot focused at the center. This is also how it can provide a 1000-foot reach. A quick unscientific test, that involved shining the flashlight on a white ceiling from a distance of 4-feet, shows that the tight spot light is about 4″ wide with a 10″ halo around it, and with a flood beam about 50″ across. I didn’t take a measuring tape to the ceiling; these are approximate eyeball measurements just to give you a sense of the ratios. 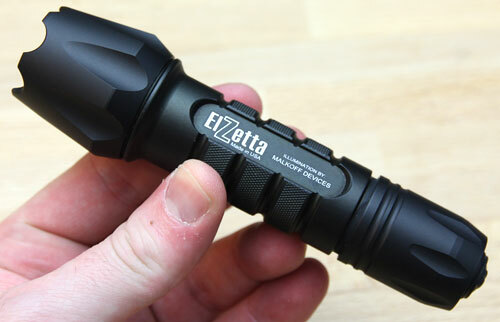 The flashlight housing is made from anodized aluminum, and the lens is tough polycarbonate plastic. O-ring seals help give the flashlight an IPX4 dust and water resistance rating (what’s this?). This means that the flashlight can handle splashing water without issue. Pressing the rubberized power button once turns on the flashlight in high mode. Pressing it a second time switches it to low mode. A third press turns it off. 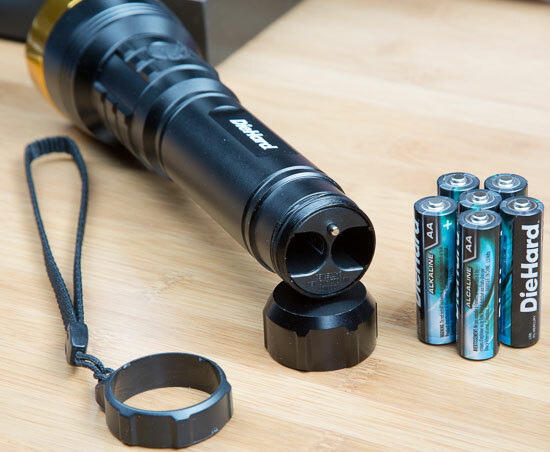 The flashlight is powered by 6AA batteries, and comes included with DieHard alkaline cells. You can remove the lanyard ring if you wish, but I found it to be quite unobtrusive. It rotates freely around the flashlight housing. Overall, I like this flashlight, despite it not being well suited for my typical usage habits. DieHard describes it as extreme, and it is. It’s extremely bright, and I feel that the housing is extremely durable and solid-feeling. The beam is a bit too focused at the center for my particular needs, but this helps the illumination carry over medium and long distances. This flashlight is really meant for reach and brightness, with even the low setting a bit too bright for closeup illumination. What I really liked was the quality of the anodized aluminum housing. A lot of flashlight makers these days boast about their aircraft aluminum alloys and anodized finished, but that doesn’t ensure a quality housing. DieHard did everything right with this design. Although I think the housing is well made, I could do without the crenellated bezel, a feature you typically only see on tactical and tacticool LED flashlights. The flashlight is priced at $80, but you can sometimes find it on sale for 10%-off. Dorcy manufacturers this flashlight for DieHard, and offers similar features in their XML 600 lumen flashlight. 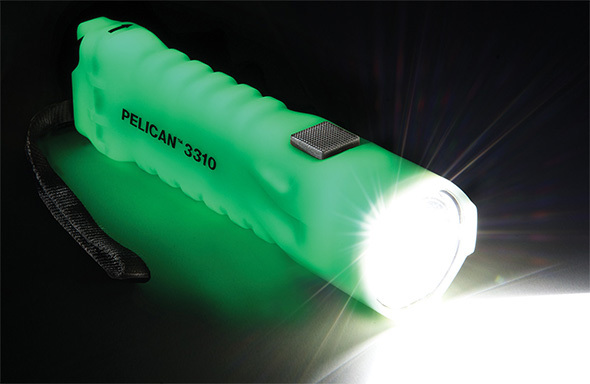 I definitely recommend this for anyone needing a super bright long-lasting flashlight with incredible throw distance. If Dorcy or DieHard made a similarly styled model with a floodlight beam profile or focusable reflector for maybe $10-20 less, I would likely buy one. Thank you to DieHard and Dorcy for providing the review sample unconditionally. Review samples are typically given away, donated, or retained for benchmark and comparison purposes. Stu, I hate to nitpick… lumens are a measure of output, but don’t necessarily relate to beam distance (throw). For throw, you would measure lux. The two main factors for throw are output, but just as important, reflector/optics shape. Two lights with the same lumen rating but different lux can appear very different in brightness. Say one was a low-lux light, or very “floody.” That would appear much less bright than a “throwier” light with much more lux, since the same lumens are focused much tighter. Also, both lumens and lux are logarithmic in perception. Generally, you need 4x the lumens or lux for a light to have twice the perceived output or to be twice as throwy (vs the same lumens in a comparable light). Anyway, sorry for the ramble, but lux really are important for the savvy shopper, which I think many readers here are. Lumens is indeed a measure of output, and throw is dependent on the design of the reflector and emitter, as well as light output. 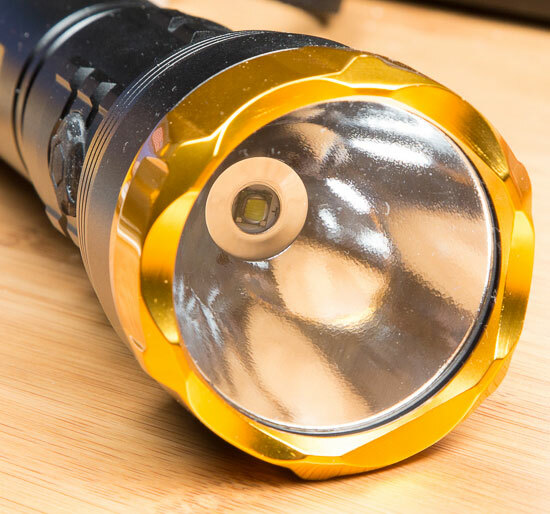 Readers more familiar with LED flashlights will know off the bat relatively how bright 600 lumens is, but those not as familiar might not be able to tell as easily. Throw distance is partially dependent on emitter brightness, and so I felt it could potentially be used in lieu of lumen specs to get a sense of how bright a flashlight is, at least for comparison purposes. Manufacturers don’t readily provide lux specs, and some don’t even provide out-the-front lumen ratings, they give total emitter specs. Anyways, thanks for the comment! I’ve slightly tweaked the statement you’re referring to avoid further confusion. I certainly don’t mean to convey that lumens directly corresponds to throw distance! Thanks for the clarification. I’ve become a bit of a flashaholic over the last couple years. I really wish more manufactures would include throw specs, but it’s output that “sells” flashlights. There’s a whole world of high-quality and affordable flashlights out there that most people aren’t aware of. For example, your Fenix LD20 is a great flashlight that I would take over anything that can be found at a big box store (although those are getting better). The ANSI/NEMA standard is used to evaluate and compare flashlights (although Diehard apparently doesn’t use it). The standards include both a range in meters as well as candela for measuring throw. If you go to Fenix’s website, you can see all of their lights use this standard. Actually, this flashlight’s specifications claims are said to adhere to ANSI/NEMA FL1 testing standards. I added mention of this to the post, thanks for bringing it up! There is a lot of funny business these days with LED flashlight claims and specs, and it’s unfortunate that such emphasis is now placed on lumens.